Like almost all areas of business today, construction and engineering are becoming increasingly affected by new technologies and the changes in working practices that have come about because of them. While not as able to change as, for instance, mostly digital verticals like finance, even the traditional sectors of construction, building and design are benefiting, albeit gradually, from new tech. It’s ironic that the uptake of technology has been slower in construction than in other verticals, as the complexity of planning, building, and maintenance of even small, discrete projects is immense. From initial concept, to design, planning permission management, project planning, plant and personnel requirements, materials, utility integration, the latest tech can make significant, positive changes to this traditional sector in a meaningful way. The data ecosystem in the construction industry is still nascent, although there are certain areas identifiable along a typical construction timeline where technology can be used highly effectively. This article hopes to consider some of these areas and will touch on the possibilities that increased tech deployment in the industry might offer. As mentioned previously, the complexity of construction means that there are potentially enormous data resources both drawn upon, and created, as projects develop. Expecting humans to be able to comb through these ‘data lakes’ is too much to expect, and not viable in purely economic terms. In IT terms, a ‘lake’ is a representation of the sum of data drawn from many disparate sources, and is often to be found in multiple, mutually incompatible formats. It’s in this environment that big data processing engines can be deployed, and these engines are increasingly AI driven. As a catch-all term, AI is definitely overused at the moment. Specifically in the context of the construction industry’s use of the technology, machine learning might be a more appropriate term. ML refers to algorithms that can refine themselves over time, increasing accuracy and producing better and, in this context, more business-relevant information. ML is especially of use in project planning and reporting phases— although its tendrils are beginning to spread. Building Information Management systems are one area where technology is finding its niche. From here, there are also more complex construction sequence simulation packages that produce powerful contextual models. From initial plans through to environmental impact predictions, these powerful apps show how buildings, pedestrians, transport systems, people and utilities all might co-exist. Here, digital modeling, powered and informed by self-improving AI can drive down project time-spans, and significantly lower labor costs. In an industry where individual projects can be geographically large, having a single source of truth in terms of data is imperative. That’s where cloud-based data comes in. Whether it’s using one of the increasing numbers of portable or wearable platforms or ensuring on/offsite communications and data flows staying up to date, cloud data repositories provide canonical data. Apps on portable devices can be specialized for onsite use, such as AR and VR routines that provide richer, more information-heavy views onto work (or predicted work). Alternatively, apps can be specifically-rendered versions (localized, or responsive apps) of more extensive, overarching project management applications. Specific information can be provided for onsite use, from data drawn from the cloud and updated in real-time by other team members, or partners, suppliers or contractors. At a consumer level, Google Maps and Google Earth have literally changed the way we look at the world. The possibilities for the construction industry in aerial imagery and mapping are profound, with accurate overviews rendered in exacting detail deploy-able at every stage. Up-to-date information aids the survey of potential sites to close-to-real-time progress reports that lower the need for onsite visits, and inform business intelligence software. Proprietary and open-source maps’ accuracy is not to the engineering industry’s tolerances (only accurate to 15 meters in non-urban areas, in Google’s case), so there are now several suppliers of highly granular aerial data that feeds into all levels of the construction & engineering project. Information now available ranges from simple drone over-flights to bespoke, high-res imagery of discrete projects, created to order. Here at Tech Wire Asia, we’d like to showcase four providers of technology for the construction industry that we feel are at the cutting edge of what tech has to offer right now. These aren’t providers of competing projects; instead, they are companies who are offering ways that data and technology can produce real and significant business results in this highly competitive vertical. InEight has long been a leader in developing software purpose-built for companies involved in capital projects. It has helped owners, contactors and engineers digitally transform their businesses to reduce risks, increase efficiency and more predictably deliver projects on time and on budget. Today, InEight is leveraging AI and machine learning to dramatically improve the project planning and scheduling process. The company created an AI-guided tool, InEight Basis, which eliminates the guesswork in project planning. Instead of starting from a blank page, InEight Basis provides project planners with a foundation to start from that is based on actual schedules from past projects. It shares “smart” suggestions on schedule durations and warns planners about potential issues, all based on historical information. Additionally, InEight Basis features an easy-to-use team member feedback process. This allows the team to collectively analyze the impact of their contribution on the plan timeline, while continually comparing the project to relevant, historical project information. The outcome is a plan calibrated by past experiences and validated by the expert team in the field. InEight Basis also works in tandem with existing critical path method (CPM) scheduling and risk management tools. With a powerful combination of AI-based and team insights, InEight Basis helps companies improve on-time delivery by giving project teams a realistic schedule that they can actually meet. If you want to schedule a demo of InEight Basis, click here. Is it possible to get your work sites and property assets, across Australia, rendered in highly accurate aerial imagery or 3D? 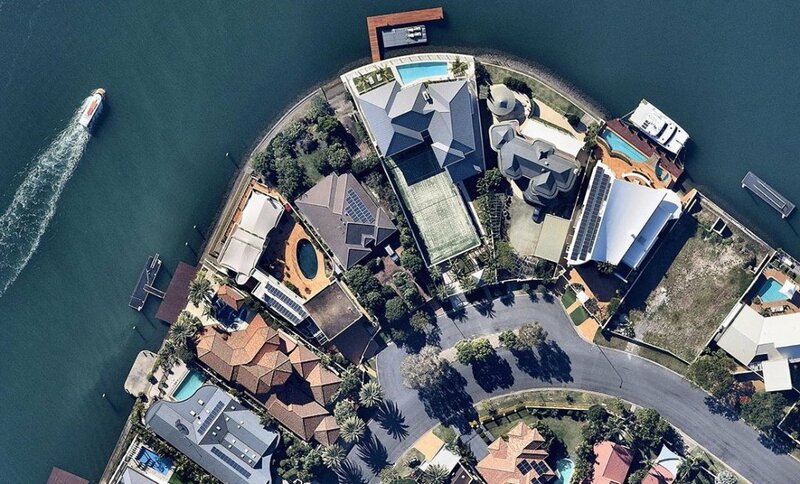 That’s what Nearmap produces. The company uses light aircraft equipped with patented camera technology, flying a regular capture program that produces fresh imagery online up to six times a year. That means images are up to date— plus, users of this company’s services can also virtually travel back in time (up to eleven years or so), to see how things have changed. Accuracy is down at centimeter level, with vertical overhead shots as well as oblique images that allow you to see around a construction site or existing building, right from your laptop or handheld. The uses of Nearmap’s offerings range from prospecting to project monitoring, via quotation creation (for a small roofing job to a full-scale development), validation and safety assessments. Nearmap also provides detailed 3D models of the six main urban areas in Australia, with up-to-date data seamlessly flowing into leading GIS platforms like ArcGIS Pro and QGIS. Interoperability is also baked into all the company’s imagery, with the high resolution data fully compatible with common CAD apps such as AutoCAD. There’s also API access if your bespoke needs dictate it. If you’re planning a project, or are at the design phase or need to monitor an ongoing project without lengthy and costly site visits, Nearmap may be the answer. Solar, roofing, construction and engineering companies of any size will find Nearmap’s solutions making significant business wins a reality. Click here to read more about Nearmap’s offerings. Procore manages billions of dollars worth of construction projects worldwide each year. It has offices across the world, with a presence in the US (where it’s based), Europe, Asia, and an Australian base in Sydney. The company’s range of solutions covers all areas of construction management, from initial planning and collaborative methodologies, through to specialist construction & engineering finances, health & safety monitoring and reporting, and field productivity solutions, covering staffing, timesheets, and much more. The company has recently gone into partnership with Drone Deploy, which provides high-resolution aerial data which further informs and enriches the software’s offerings. This overarching media joins (in one central repository that’s cloud-based) any data or images captured by staff using one of Procore’s powerful mobile apps. The secure central data vault is encrypted at source, but is instantly available right across the project. Even unconnected devices can upload and synchronize data once reconnected, making collaboration and communication along a project’s lifecycle a reality. It’s a reality which is proven to make staff and systems more efficient. As well as onsite data flows and offsite monitoring and planning, the Procore platform helps businesses draw insightful reports both during (as part of change management processes) and after projects have completed. There are a series of default reports quickly available, plus companies can easily design their own bespoke reports from the information at their disposal. With a traditional BIM offering massively enhanced by its own artificial intelligence algorithms, Kreo offers a single platform for construction project planning, cost estimating and bid pricing. There are three spurs to the solution from the British company: Kreo View, Kreo Design and Kreo Plan. The View application is a collaborative framework that draws together all the players involved in a construction project, providing them with a range of channels where data, opinion, and empirical information are gathered to produce a realistic and visual data environment for BIM. Kreo Design takes models exported from Revit into Kreo to be shared with unlimited users who can, according to assigned privilege, mark up specific BIM elements. Kreo Plan uses AI to help see errors in Revit models and aids in solving issues without having to drill into too much detail. Kreo Plan helps automation of quantity take-offs, cost estimations, scheduling, tendering and bid-pricing, as well as being a platform for what-if scenario modeling. This is ‘digital twinning’ for construction. With BIM experts spending more time planning than having to improve a plan in real-time, the AI helps produce a base plan that’s more realistic, more quickly. Human expertise can then make decisions based on real data instead of relying on gut instinct or good old-fashioned hunch.